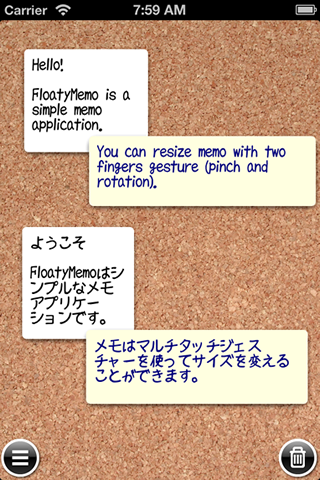 FloatyMemo is a simple "sticky note" like application for iPhone/iPad (Universal application). 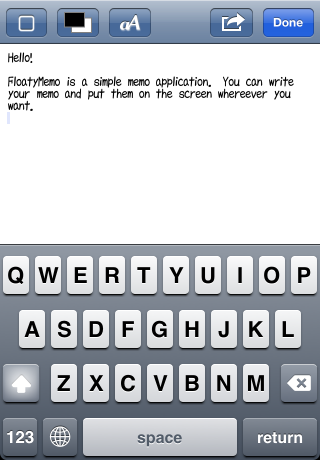 FloatyMemo is FREE software. 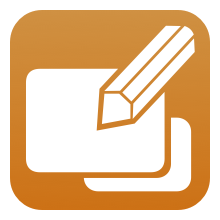 "Sticky note" like - a simple note application. You can put your notes anywhere on the screen. Works on the both screen mode, portrait and landscape. Flexible resizing with two finger gesture - pinch and rotation. Advanced version - FloatyMemo+ is available. You can put your notes anywhere on the screen. Creates new note on the screen. If "auto start editing" is ON, the editor screen will be opened as soon as new note is added. Opens notes list in the trash-can. Single tap → shows options (depends on the settings). Double tap → do quick edit (depends on the settings). Drag & drop → reposition the note. Pinch & rotation → resize the note. Touch & hold → wiggle the notes. Editor screen to edit a note. Tick or untick the note. The button indicates the current tick/untick status. Change text color and background color (shows color picker). Change font and font size (shows font pikcer). Launch ATOK pad (if available). You can define how to work single tap and double tap gesture. Start edit : opens the editor. Minimize : minimizes the note. Show options : shows option buttons. Tick note : ticks or unticks the note. Quick edit : edits the note on the spot. Do nothing : no action. You can define how to behave "tick". Tickmark image : shows tickmark image on the note. Seme-transparent : makes the ticked notes semi-transparent. Minimize : minimizes the note at ticking. Read only : makes the ticked note read only (but you can still modify font and colors). If it's "ON", notes will be shown with shadow. Changes the toolbar styles on main screen. If it's "ON", ediotr will be opened automatically at adding new note. If it's "ON", notes will be opened with animation. Defines default font. It does not affect the existing notes. Defines default font size. It does not affect the existing notes. Defines default text color. It does not affect the existing notes. Defines default background color. It does not affect the existing notes. Showing all notes in trash-can as a list. Removes the note from trash-can. Pressing the button again to empty the trash can (clearing all notes in trash-can). Reverts the notes from trash-can. 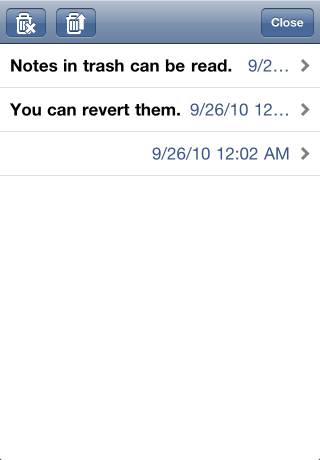 "Flick" gesture is also available in the list to revert the notes. Copyright © 2010 SerendipityNZ Ltd., All rights reserved. Some icons are designed by PixelPress Media Design / Gary W. Gehiere. The icons are distriobuted under the Creative Commons Attribution 2.5 Canada license.